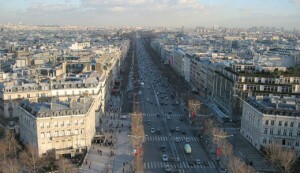 VALENTINA BRATTESANI bornwas born 22 July 1869, at 55 Boulevard Pereire, 17th arrondissement de Paris. She is our great grandmother . She had a very brief life but thanks to her we are now here to tell her story. In her short life she endured much pain and heartache. Her two marriages produced ten children, four of whom survived, and these four surviving children are the forefathers of the Quilietti descendants today. 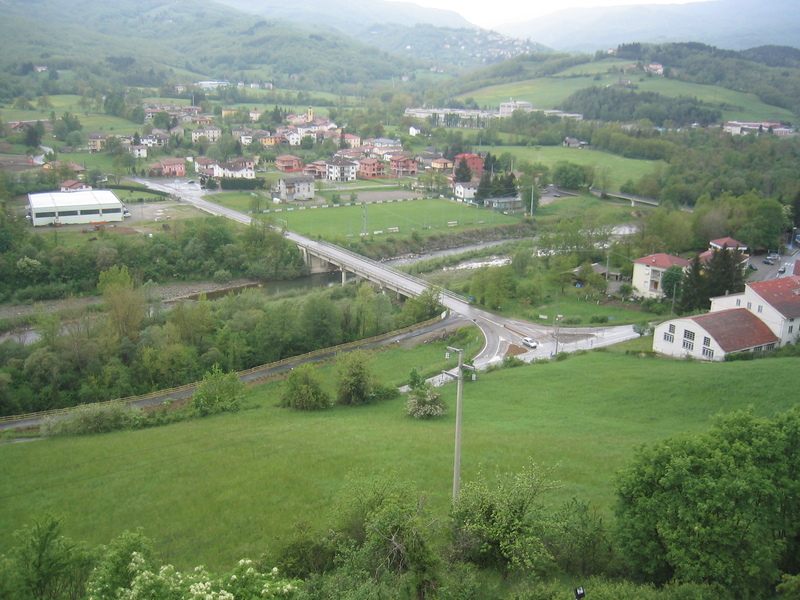 Her parents origins were as we now know the region of Borgo Val di Taro Parma in Emilia Romagna. From their village came to Scotland three brothers Joe, David and Angelo but there was almost certainly more uncles, aunts and cousins . 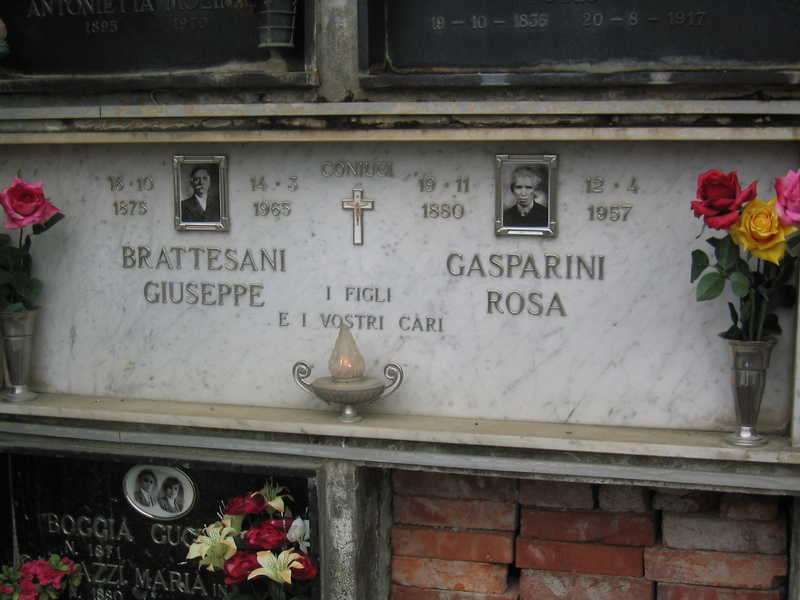 Her father was Joe or Guiseppe. 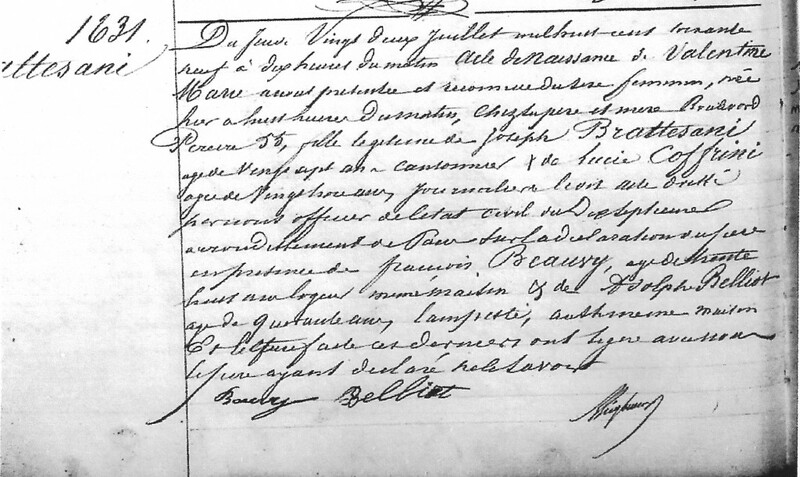 Joe Brattesani was born in Italy, in the year 1841. 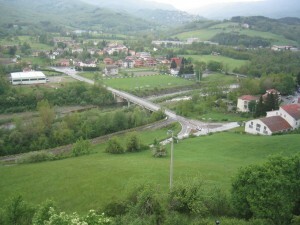 His home was in the region of Borgo Val di Taro where there were two villages which were the origins of the Brattisani family in Italy. They were Rovinaglia and San Vincenzo, two very small villages where all Brattisanis have their roots. There are two cemeteries there today where many descendents of Valentina lie. Joe married a local girl by the name of Lucia Coffrini on 1st April 1864 in Parma in Northern Italy. Parma previous to the unification of Italy had been part of the French Empire under Napoleon. 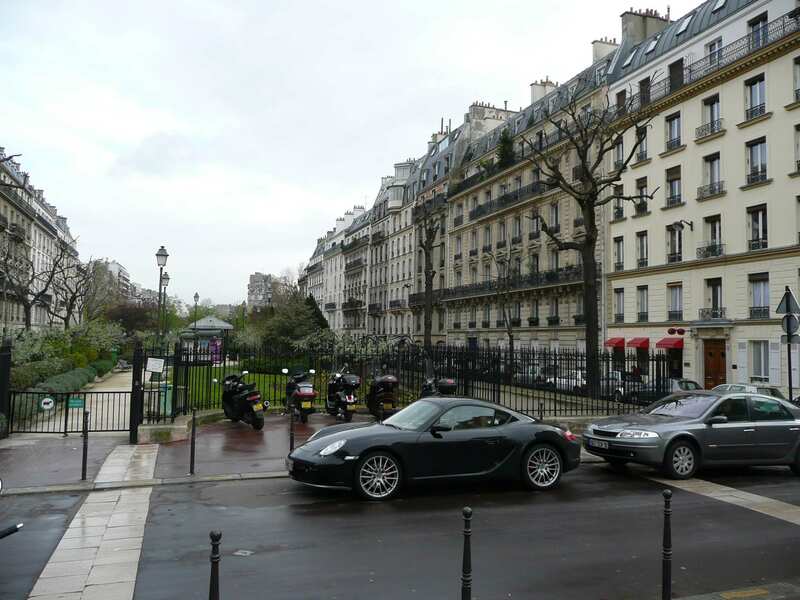 Perhaps this is one of the reasons the Brattesani family had close ties with Paris. 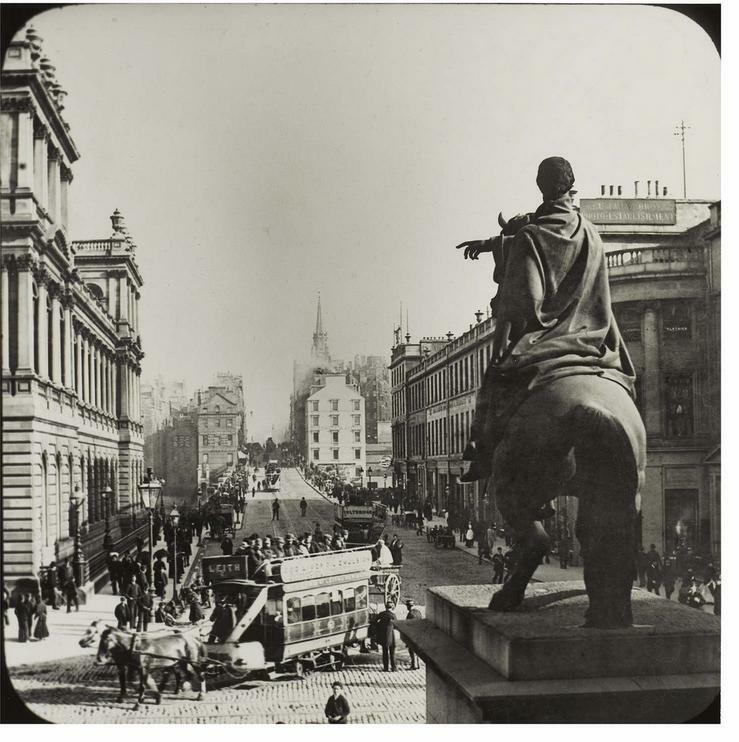 Joe was a shrewed businessman, and had at first set up a business in Paris before finally settling in Edinburgh. He ran his businesses from the two cities and both he and his wife made frequent journeys to and fro. The result of this was that their children were born in different cities in different countries. 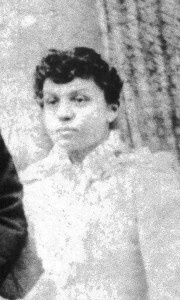 Rose was born in 1871 – she married into the Giulianotti family. Maria [Mary] was born in Leith in 1878 and she married into the Fusco family. Louise was born in Paris in 1889 She married into the Costello family. Louie was born in Edinburgh in 1898 but died in 1903. 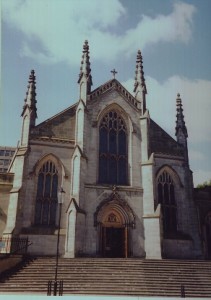 By 1885 Joe and Lucia had settled in the Scottish Capital at an address 5 Middlefield, which is just off Leith Walk in the centre of Edinburgh. Joe, my great-great grandfather, was the first of the Italian immigrants to have a fish and chip shop in the city. St. Mary’s Cathedral would have been a short stroll away, just further up the hill. 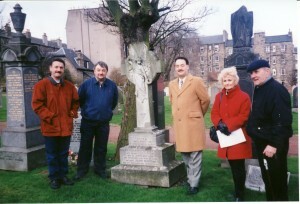 It was here that her association with the Edinburgh Italian Community in Edinburgh would have started. 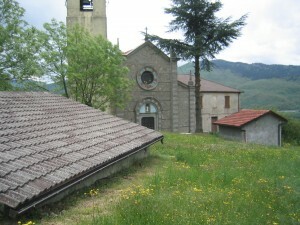 The family would have been frequent visitors to the Church and we believe it was here that she met and of course eventually married Emilio Quilietti. There would have been many family members at their wedding, and their documented witnesses were A. Donati, restaurant keeper, who was Emilio’s cousin. 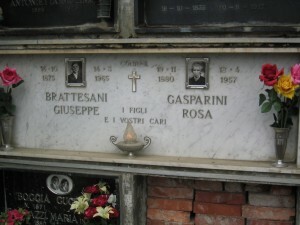 J. Brattesani and Rose Brattesani were of course Valentina’s sister and cousin. Emilio’s profession here in 1892 was still that of a stucco figure maker and we know that he soon entered into the ice cream trade and in the next six years was to run no less than 8 shops. They started off their married lives at Cranston Street, just off the Royal Mile, where their son Julio Emilio was born. By 1894 they had moved to 12a Calton Hill and it was here that Leonardo Giuseppe was born in November of that year. With their growing family 1894 saw them move further down the hill onto the main street to 24 Greenside Place, which was just opposite St. Mary’s Church. 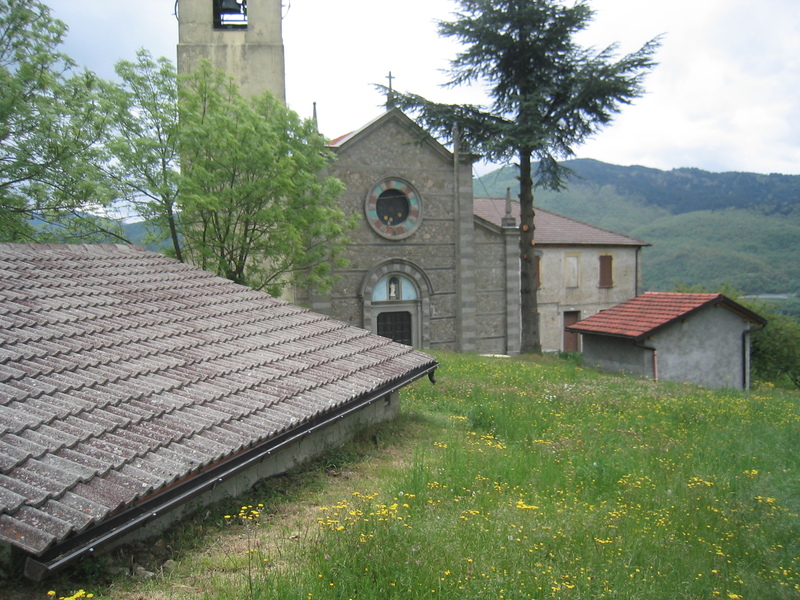 Their remaining three children were all born here, Joseph Angelo in 1897, Eletta in 1897 and Amelia in 1898. This address was not part of the large run down victorian tenements just further up the hill, it was a prestigious address of Georgian Town Houses. 24 Greenside Place is situated just beside what is now known as the Playhouse Theatre. The family lived here and Emilio worked very hard building up his new business as ice-cream maker. 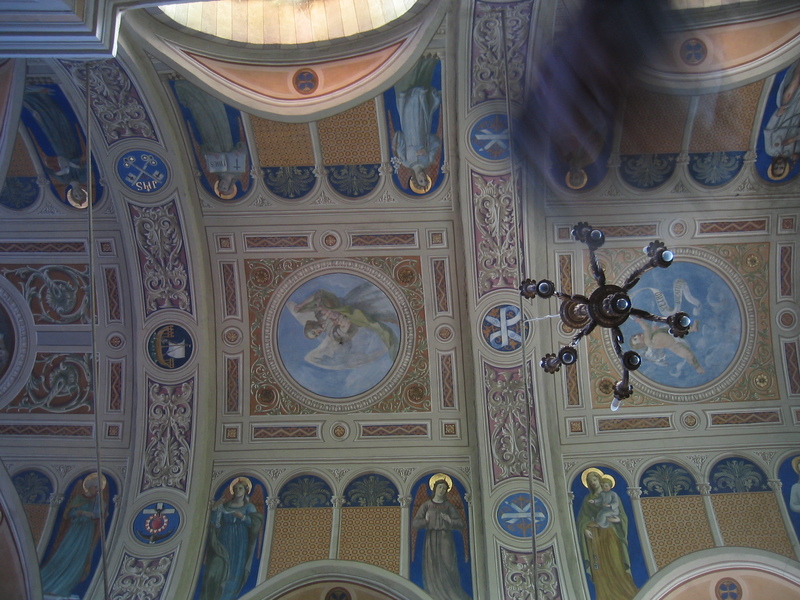 They had 6 children in the first six years of their marriage, and Valentina would have had help by way of a ‘servant’ who may have been one of the extended Italian family who were emigrating into the country in great numbers or perhaps one of the local girls who worked for the growing businesses. They would have found work with Emilio in his shops or helping out in the family home. However things were to change dramatically when on 9th January 1898 Emilio Quilietti died 12 days into a bout of typhoid fever. He died at home. With no antibiotics in these days this illness was frequently fatal. Two months later on March 31st their two year old daughter Eletta Quilietti died of Celebral Meningitis. They are both buried in a plot in Easter Road Cemetery, Edinburgh. But more heartache was to follow on 5th October 1900 when Valentina’s mother died at home at 9 Greenside Place. She was 54 years old. Two days later Emilio’s youngest daughter Amelia died suddenly age 1 yr. 6 months old. 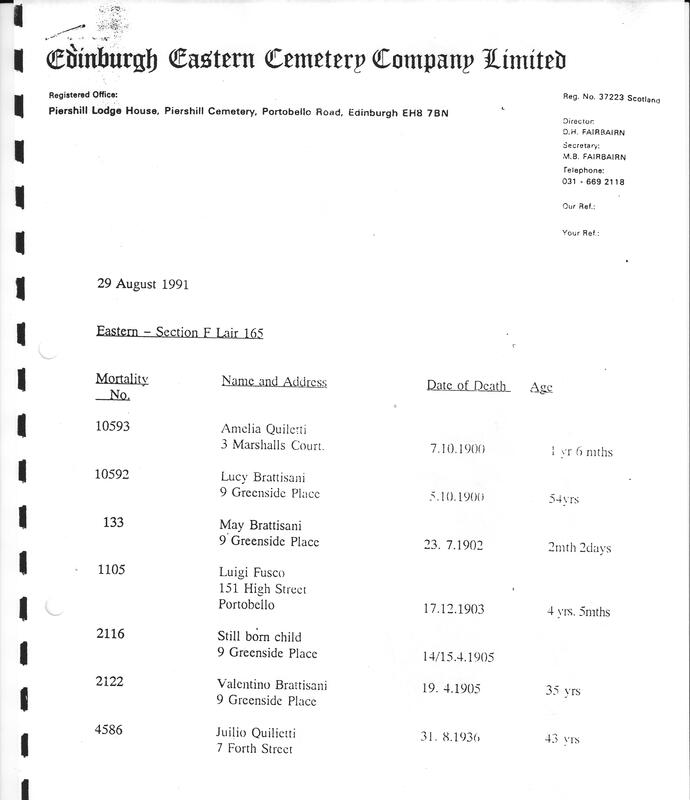 They were buried at a double funeral at a new family plot also in Easter Road Cemetery. The year 1901 saw the family Brattesani all together at 9 Greenside Place. Valentina Quilietti was described as the head of the family and with her were three of her four remaining children, her father, uncle, two sisters and three cousins. 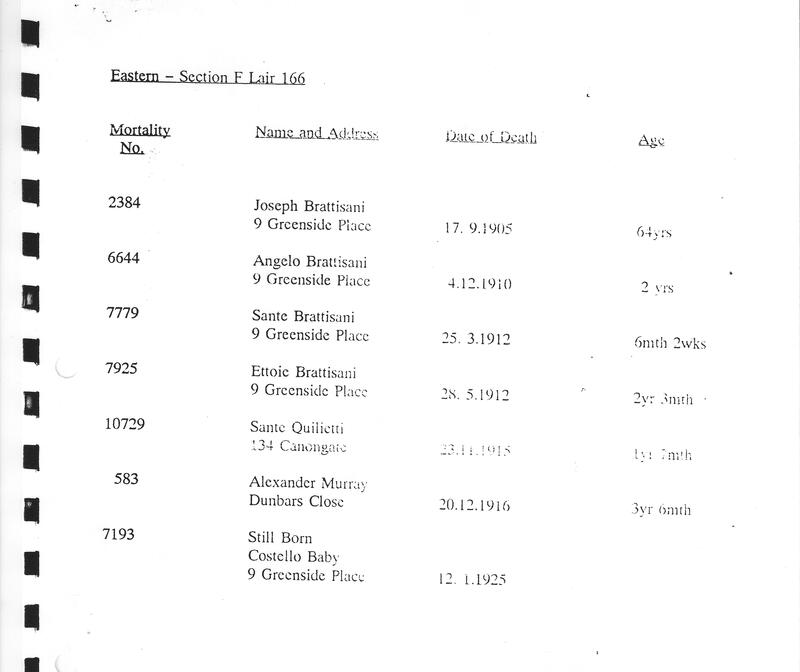 One of these cousins was Sante Brattesani, two years younger than Valentina, born in the year 1873 in Italy. Sante worked in the restarants helping out with his two brothers. His father David had emigrated with his family a couple of years earlier. Valentina married this younger cousin later that year. But circumstances were not kind to them and they lost four children in so many years. 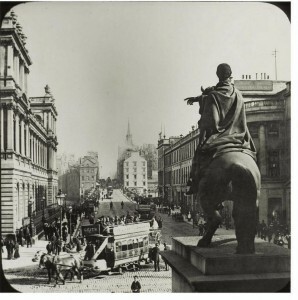 Sante took over the running of Emilio’s shops and we know that it is documented that he ran the shop at the bottom of the fighting five steps at the top of Leith Street. But it was Mrs. Quilietti’s fish and chips that were remembered with great affection by the men fighting at Gallopoli. Valentina died shortly after giving birth to her tenth child. There were many complications during the birth and her weak state could not fight the severe infection. The date was 15th April 1905. 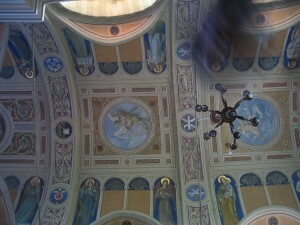 Her four surving Quilietti children were now orphans. She is buried in Easter Road Cemetery beside her mother in Section F. Lair 165. 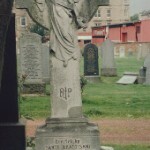 Sante Brattesani erected a white cross and angel over the plot in her memory. It is a beautiful memorial dedicated at first to a beautiful young lady. 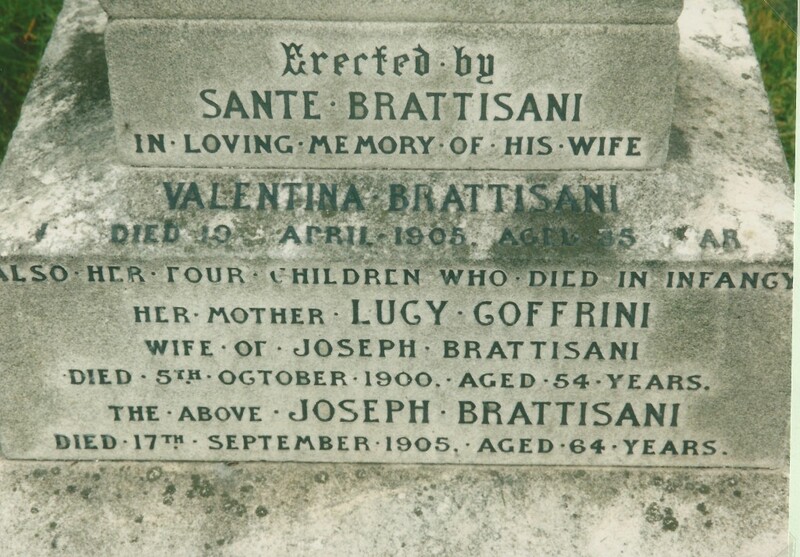 His grief at the loss of his young wife and cousin was apparent but on the inscription there was no mention of Valentina’s baby girl, Ermenia Quilietti, who died five years earlier and was laid to rest on the same day as her grandmother Lucia Brattesani. But the world was to know for sure who erected the monument. The short life she had was filled with much pain from the death of Emilio in 1898 until 1905. She is our great grandmother and we will cherish her memory with great affection. Valentina, our petite grandmother, born in Paris, and mother of all the Quilietti children in the whole wide world today. We will remember you with great pride. What circumstances made you to decide on your cousin as a new husband we shall never know, but it was this marriage which led to your very early death. Your ancestors are now many and your memory lives in our hearts today. Still Born Costello baby born 9 Greenside Place 12th January 1925. After the death of Valentina the Quilietti children were left orphans, brought up by their Brattesani uncles and aunts and also by employees of the family who we now know had a great hand in bringing up the youngest of the children. Sante, their stepfather, wanted no part in their upbringing and we know that he threw out Valentina’s belongings, amongst which were photographs of the Quilietti family all together here in Scotland in the year 1901. The young Valentina Quilietti however was ever vigilent and rescued these and sent them over to her uncle Giuseppe Quilietti who lived in Rhode Island. 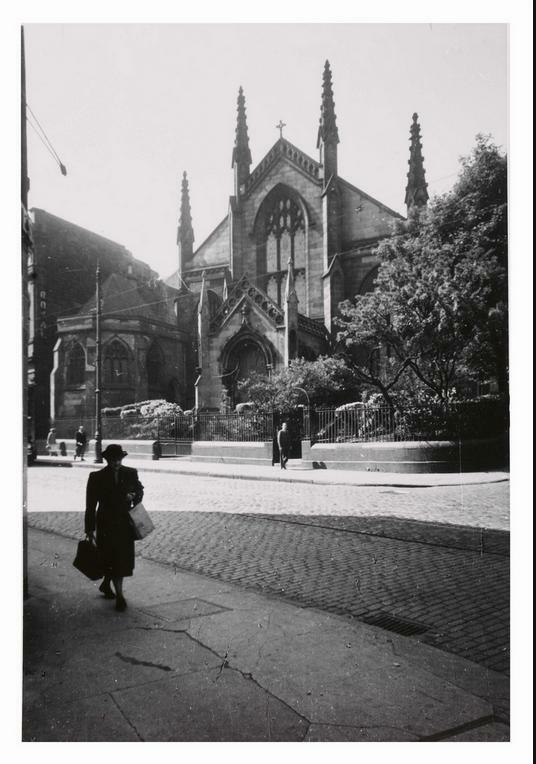 It is thanks to her that we have these treasured photographs today. The next year Sante returned home to Italy and met up with his childhood sweetheart a stunningly beautiful girl whose name was Luigia Peruzzi. 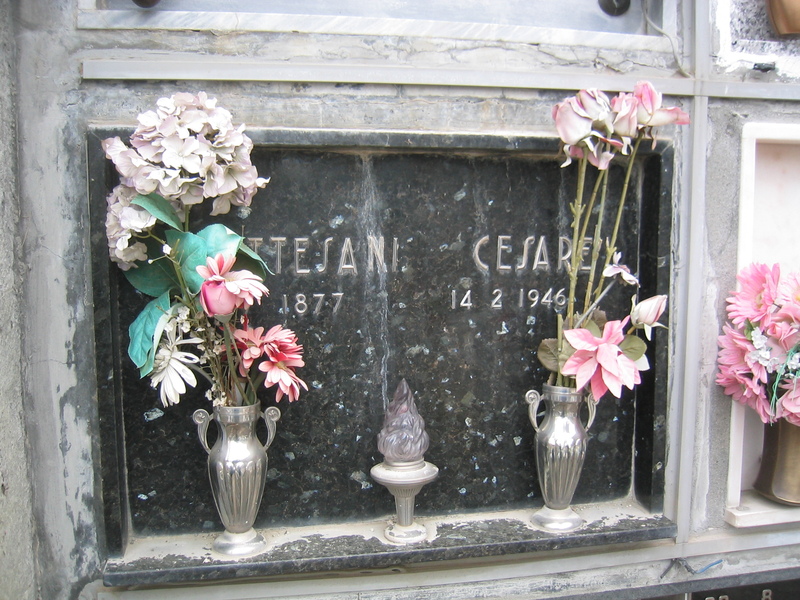 They wasted no time and married in San Vincenzi in Italy on 7th November 1907. The couple again left Italy and returned to Edinburgh. For whatever reasons they married again on 4th January 1907 at 53 George IV Bridge, Edinburgh. They had four children, two who survived. 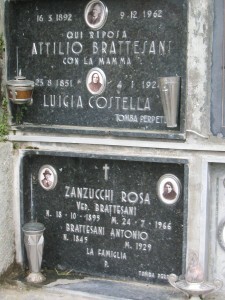 On the double headstone under the name of Attilio Brattesani is the name “Luigia Costella” which Costella is my family name. 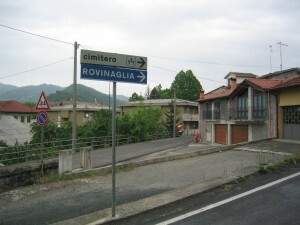 My family is from Borgo val di Taro. My grandfather is Mario born 1909; brother to Aldo, Alfonso, Eugedio, Maria and Pierina all whom have died. We still own their original house on via padre bracci. All our relatives now live in New York. The headstone just so happens to be right here on your web page 🙂 Its the one located under the picture of the old church.